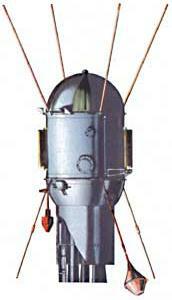 DS-U1-A was a Soviet satellite which was launched in 1968 as part of the Dnepropetrovsk Sputnik programme. It was a 385 kg spacecraft, which was built by the Yuzhnoye Design Bureau. It was equipped with eight telescopes for optical observation, and one for ultraviolet astronomy. A X-ray experiment was also carried. A Kosmos-2 carrier rocket was used to launch the satellite into low Earth orbit from Kapustin Yar. Upon reaching orbit, the satellite was assigned the Kosmos 215 designation. Kosmos 215 performed ultraviolet photometry of 36 A and B stars from parallel telescopes and two UV photometers with maximum responses at 274.0 and 227.5 nm. Its x-ray telescope was used to measure radiation between 0.05 and 0.5 nm. It was primarily used to study the Sun, although several other X-ray emissions were detected. Kosmos 215 completed operations on 6 June 1968. On 30 June 1968, it decayed from orbit and reentered the atmosphere. These satellites provided valuable information on energy distribution in spectra of various stars. Photometric studies of stellar radiation in ultraviolet and X-ray spectral regions.